Bonsai is a meditative art of dwarfing full-sized trees and shrubs into a pleasing form by trimming branches and roots or wiring branches until they are trained into a desired shape. 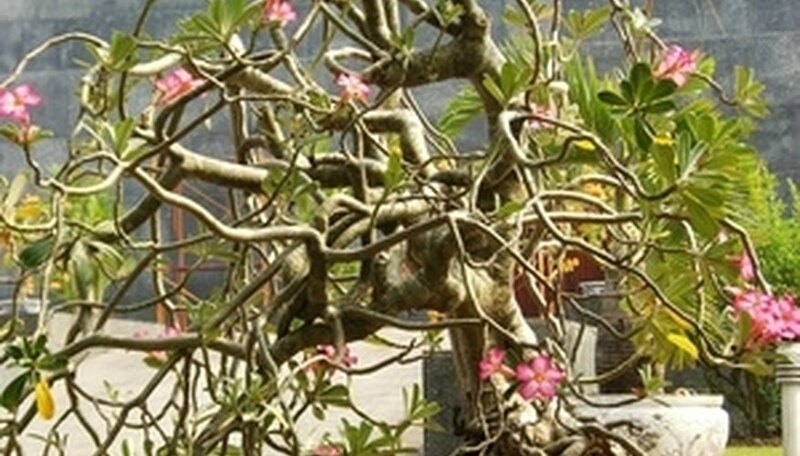 The art of bonsai has been practiced in Asia for centuries. The term literally means "tray planting," for the shallow trays in which bonsai grow. Plants in the rhododendron family make dramatic and beautiful bonsai. Bonsai is an art form; it takes time and practice and, like many art forms, much trial and error before one masters it. Select a healthy plant in the rhododendron family. Satsuki, Rhododendron indicum, or Kurume azalea are popular choices among bonsai enthusiasts. Determine a style for your bonsai. Rhododendrons lend themselves well to root-over-rock, semicascade, windswept, slanting and informal upright styles. Study each style so you are better prepared to trim your bonsai. Remove the rhododendron from its pot. Gently brush the dirt from the roots Trim away at least half of the roots. Mist frequently with your spray bottle to keep the roots hydrated. Soak the bonsai roots in a shallow bucket of water with a mixture of vitamin B-1 or ferrous sulfate for 30 minutes. Mix according to package direction. Super Thrive or Miracle Grow are good brand names. Plant the rhododendron in your selected pot. The pot is a part of the bonsai and must create an overall pleasing display. The pot must have excellent drainage. Rhododendron need acidic, well-drained soil. For best results, use a soil specifically designed for bonsai. This will have all the qualities your bonsai will need, such as good drainage, water-retention and aeration. Water your bonsai well, making sure the soil is evenly moist. Shape your rhododendron by cutting away branches that do not belong with sharp garden shears. This is a very personal decision and will be determined by the style you chose. Study your plant and prune with care. You may wire any branches in place to train your bonsai in your desired style. Start at the base of the trunk, wind the wire up to your branch, and bend to shape. Do not pull the wire too tight, or you risk cutting into the woody stem and damaging your bonsai. Place your bonsai in filtered sun and if outdoors, protect it from heavy rain or frost. Never place your rhododendron bonsai in direct sun. Fertilize your plant every 2 to 3 weeks during the growing season until the flowers bloom. Dilute the fertilizer with water so as not to burn the bonsai's shallow root system. Never use a fast-grow fertilizer on your bonsai. One specifically for bonsai is best. Water your bonsai frequently. The soil needs to be kept evenly moist but not soggy. Do not let your plant dry out. Brush the leaves of your bonsai once a week with a soft brush to maintain it's health. Remove any plant debris on the soil as soon as possible to avoid the growth of fungus. Remove yearly growth with sharp scissors as soon as the flowering season ends. Cut away any secondary shoots in midsummer. Remove your bonsai from its pot every two to three years in the late summer. Cut away at least one-third of the root, and repot. Monitor your bonsai for pests often. Because the bonsai grows in a moist environment, insects are attracted to it. Treat with pesticide when necessary. Consider the shape of your rhododendron before choosing a bonsai style. Training the bonsai in a style similar to its natural growing pattern is a good way to learn the art of bonsai.